I am still sewing, even if I haven't been blogging about it much lately. I've been quiet here partly because I've been doing a lot of experimenting to come up with projects for the 'Twas the Night blog hop that starts next week and partly because I've been working on the tractor commission quilt. I'm really pleased with how that's turning out, but it's not much to post about yet. However, I do have some things I can share. I have finished embroidering the words for another Psalm 19 mini. Now to add the flower applique details, embroider them and then sew on some borders. Maybe I should have ironed it before taking the picture? I haven't actually sewn anything onto this next project yet, but it's just so pretty I had to share it. This belongs to Liz, of Green Cheese Quilting. The star in the middle is her Round Trip Quilts starting piece, onto which Jennifer, of Never Just Jennifer, added all those beautiful HSTs. I've had it out, just lying around, for a couple of days as I ponder what I want to add as my contribution. I haven't fully decided yet, but I think I want to pull out the navy that features in some of those prints, especially the Cotton + Steel lions that are peeking out from some of Jennifer's HSTs. We have a four day weekend starting now, so I'm hoping to get a lot of sewing done during the break. Unfortunately, most of what I'm hoping to get done is for the blog hop, so I won't be able to share much until then. My day to post for that is the 18th, and I'm hoping to have a tutorial ready to go along with my one of my projects. The hop itself starts on Tuesday, the 11th, and everyone is sharing quick and simple gift ideas so there should be plenty of inspiration for just about everyone on your Christmas list. It should be fun! 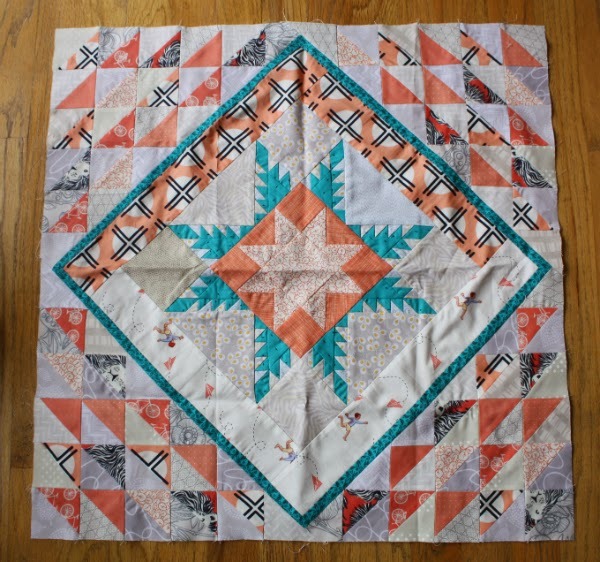 Have a great quilty weekend! I also forget to iron before pictures! Thanks for being real. I really love the embroidering the cursive really adds to the look of it. 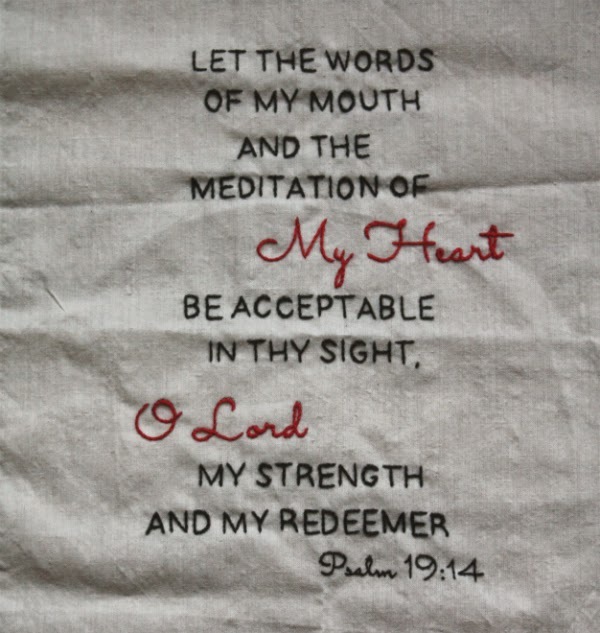 Psalm 19 embroidery looks lovely. I'm afraid my skills with writing on quilts are to limited to use of a pen and a lightbox to trace a computer printout! Hope you have had a productive and fun weekend. Allison, that embroidery started out as a traced computer printout! And my fancy pants lightbox is my kitchen window! I hope you're having a great weekend too.